Welcome! The BSM system is loaded with features and may feel a little overwhelming at first, but the setup of the system is actually very easy once you understand how things work together. I will walk you through the basic setup from the initial unpacking through to a working system. So lets get started. Follow this instructions located on the floating text. After you place your prim inside the doohickey, ignore error messages. This is part of the creation process. It's tacky, I know. Take each component that was made by the doohickey. Take each of these components INDIVIDUALLY. This is the "stuff" for your BSM System. There are 3 styles of standard vendors, 3 styles of affiliate vendors, the admin panel, the customer panel and the server. You will need both the boxed product and the texture when you setup your server. AFTER TAKING EACH COMPONENT IT IS BEST TO LOGIN ON THE WEBSITE AND DELETE ALL ASSETS THAT ARE NO LONGER INWORLD OR ONLINE ( ASSETS > SERVERS / RELAYS / KIOSKS ) TO AVOID ERRORS OR A MESSED UP ASSETS LIST!! Rez "BSM Server Frame" and "BSM Server"
Move the server into the server frame. Before accepting the permissions, place a short name in the DESCRIPTION field of the BSM Server. Maybe "Furniture" or "Hats". Next accept the permissions and select "Primary" from the dialog menu after it appears. You should see the server start up with your newly created name on the floating text. Right Click the new server and select "Edit..." from the pie menu. Click the contents tab and drop your boxed product into the server. You will repeat this for each of your products. You can drag multiple items at the same time into the inventory. Each server can hold 100-200 items because even when BSM can work with unlimited we still have to deal with the Second Life limits. The exact max off products in a server depends on the amount off items in its content and namelength off each item. Its better to have several servers than to over fill. There is no limit on the number of servers. DO NOT USE THE AMPHERSAND SYMBOL (&) IN SERVER NAMES. Apply your product texture to the front of the vendor. Once the vendor resets, touch the vendor and select "Sync Item" from the menu. This will send you product to the website for use in multivendors, affiliates, and provide the ability to edit the products remotely. Make a purchase on this vendor and make sure dispenses correctly. If all instructions were followed precisely, you should have no problems. If you prefer using the web user interface, you have that option as well. To set up a product from the website, place your texture, along with your boxed product, into the server contents. The texture does not need to be named in any specific manner as you will select it later in this process. Next, you will login to the BSM website and select Assets > Product list from the menu. Once on the products page, click Add New Product in the top right of the page. In the dropdown form, you will be prompted to select a server. Choose the server for the product you are configuring. The page will reload with the remaining product setup fields. Note that only products that have not been setup will show in the Product selection field. Select your product and texture and apply the remaining options to the new product. Once you have completed this, submit this form. To get this product setup onto a vendor, you will use the Product Code for this new product. This can be found on the Assets > Products page once it refreshes. Rez out a new vendor or use a vendor from inworld. This will only work on single item vendors. In the description field, enter this product code following a caret symbol ^. Once you have entered this into the description field, touch the vendor and it will load your new product. Prior to setting up a multivendor, you must have your products listed on the Assets > Products page. 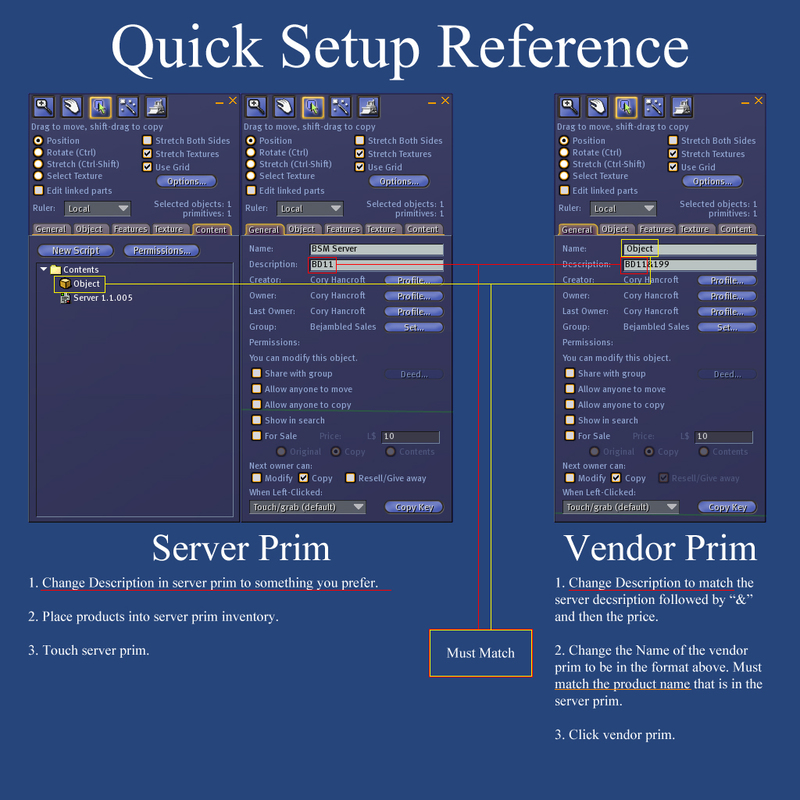 If you have not done this yet, refer to the Single Prim/Singe Product Vendor Setup above. Login to the BSM website and go to Assets > Bundles. In the top right portion of the page, you will find a link for Add New Bundle. Click on it. In the form that appears, choose a name with numbers and letters only and keep the name less than 32 characters. Once you have created a name, click Add New Bundle. Once the bundle has been created, you can then modify the new bundle and add the products. When you have finished adding products to the bundle, scroll down to the bottom of that page and click on the green words 'Submit Products To (name of your bundle). That brings you back to the Bundle Assets page where you may then click on organize. This will allow you to drag and drop the products into the order in which they will be displayed on the multivendors. Take the vendor in Edit ( right click > Edit ) and Copy & Paste the Bundle Name into the Description field from the vendor and reset the vendor. Follow instructions on floating text and local chat. Once you are told to take the storecard, proceed. Rename and texture the new storecard to you liking. Take the completed storecard into inventory. Storecards are sold in the same manner that the products were setup. Create a new vendor and configure as the above vendor setup. These cards can be sold, given directly as gifts or promotions, or can be sent via your BSM Mailer. DO NOT SEND THESE IN SL NOTICES UNLESS YOU ARE ON CRACK! THESE STORE CARDS CAN BE VERY DAMNING IF NOT HANDLED PROPERLY. Sent in a SL notice will allow anyone in the group to receive as many copies as they want. This is required when making changes from the website that affect vendors inworld. You will need a relay rezzed at each region you have your vendors rezzed. Rez these are freely as you like. These are used by the customers to check store credit, past purchases, signup for the mailer, groups and such. You will want them available in your store so that they may get items redelivered without bothering you. This is considering you have your products set to allow redelivery. Rez this mailer/admin panel in your work area. This is used to update your group and logo. This is also used to send out notices and updates for products. This crash course guide will get you up and running with the most basic of features. For a more detailed set of instructions, check the "Destructions - Features" and "Destructions - Setup" notecards included in the pack. Play with the settings on the website and do not be afraid to tinker around. Once you get a handle on the system, it is a piece of cake. If you still have problems or questions feel free to file a Support Ticket from the website or contact any staff member from BSM wich can be found in the BSM group inworld. Most group members are also willing to answer your questions if you do not see any staff online and prefer to get an answer right away if possible.